Silky smooth emulsified pork with cubes of house-cured back fat, cinnamon, and black peppercorns in a wide diameter of about 6". 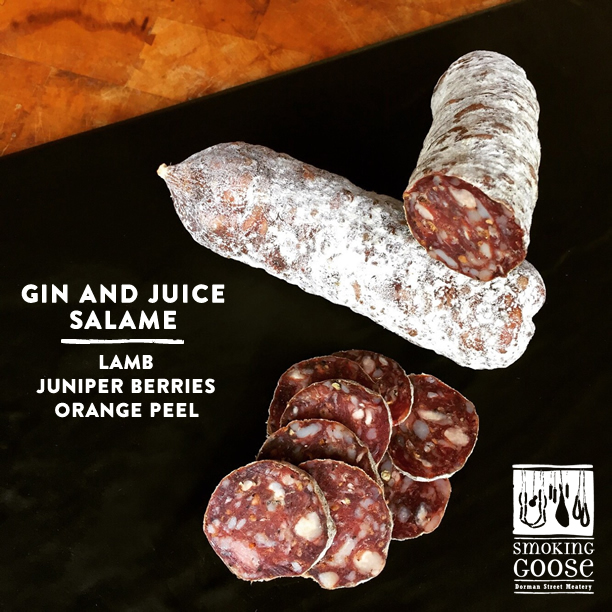 Pork collar salame with paprika, white wine, crushed red pepper, black pepper, coriander, and juniper berries. Smoking Goose's downtown Indianapolis meatery is on Dorman street, named after the grandson of Indiana's fourth governor. 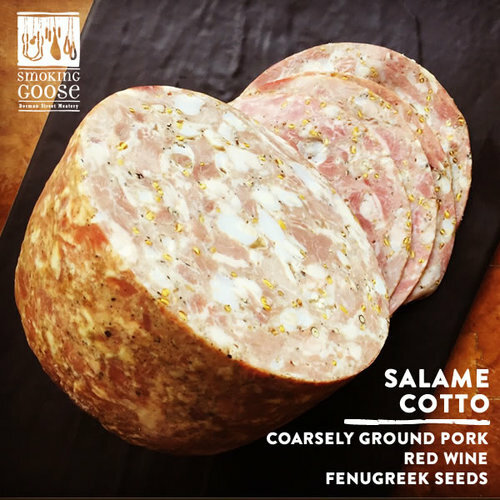 coarse-grained pork salame with fenugreek seeds and organic red wine in a wide diameter of about 6"
Pork salame with clove, nutmeg, ginger, and black pepper in a wide diameter of about 4". Pork salame of fennel pollen and pink peppercorns with a diameter of about 3-5". 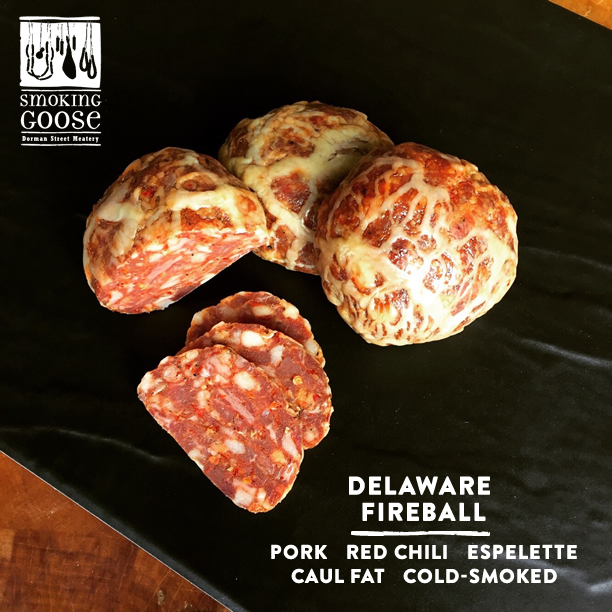 In honor of the unofficial name of goose's first indy neighborhood: "Dodge city"
Crepinette salame of pork with red chilies and espelette pepper wrapped by hand in caul fat and cold-smoked for days in our gravity-fed smoker before fermentation and aging. Goose's first Indy address was at the corner of 25th and Delaware Street. Lamb + a little of pork for texture with crushed juniper berries and orange peel. 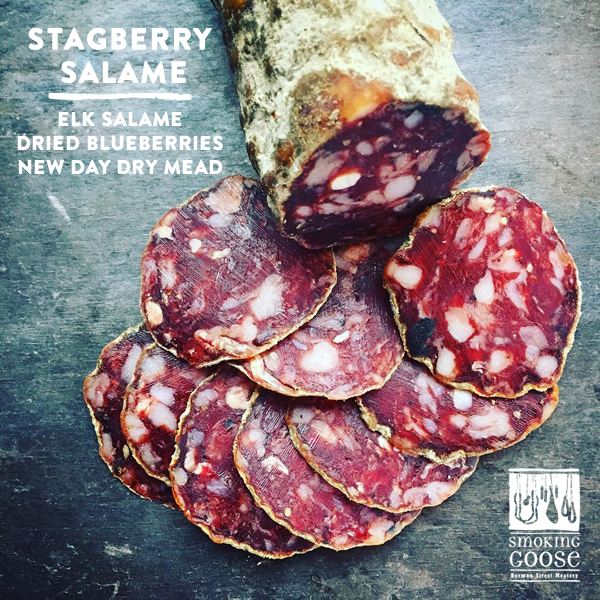 Elk + a little pork for texture with dried blueberries macerated under New Day craft's dry mead. 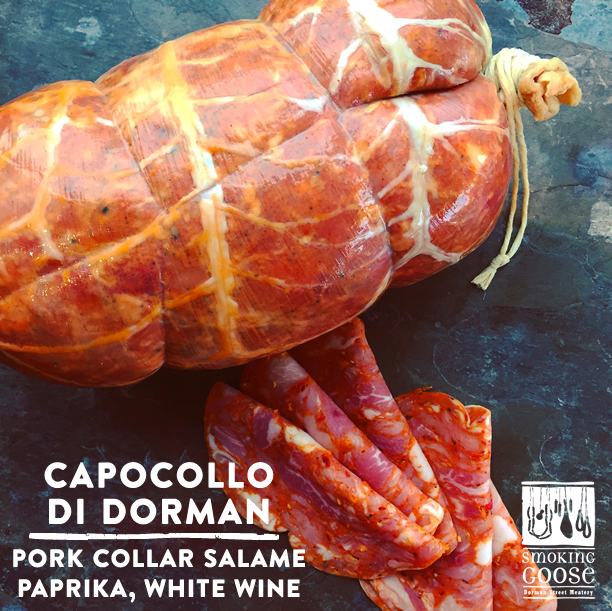 Looped pork salame with pork heart + liver, espelette pepper, chili, and red wine. 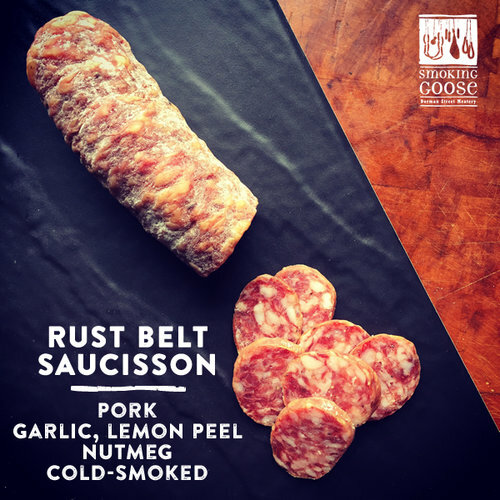 Hard-working history, renaissance spirit: our brand new Rust Belt Saucisson hits close to home. 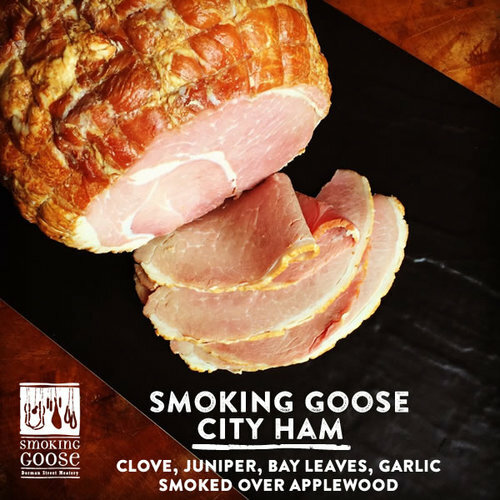 100% purebred Duroc pork from fourth-generation Gunthorp Farms in LaGrange, Indiana, is blended with white pepper, garlic, lemon peel, nutmeg, clove, and cinnamon before cold-smoking over applewood, hickory, and barrel staves. The following items are not available every day but are released at different times throughout the year. Check in with your sales rep for the latest offering. 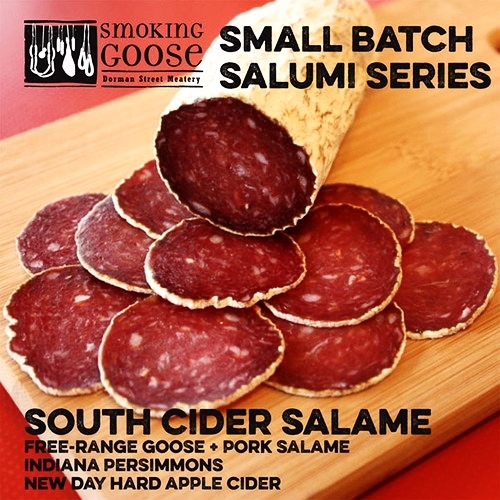 Gooseliver, smoked goose breast, persimmon pulp, dried persimmons and New Day Craft South Cider hard apple cider. 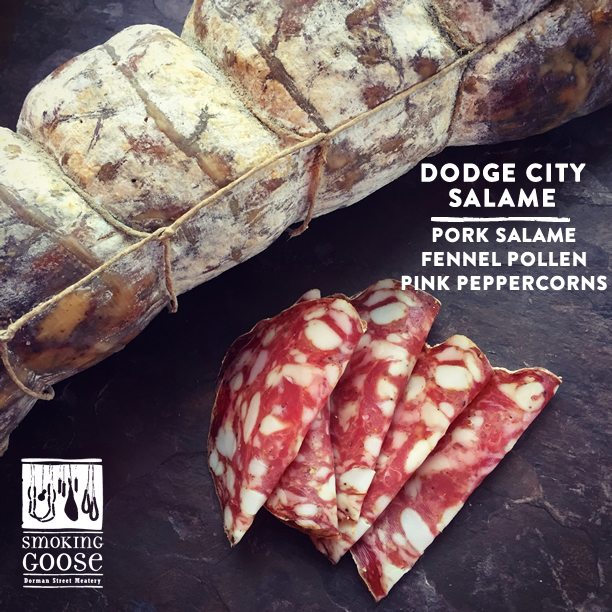 Small batch salumi series annual release. 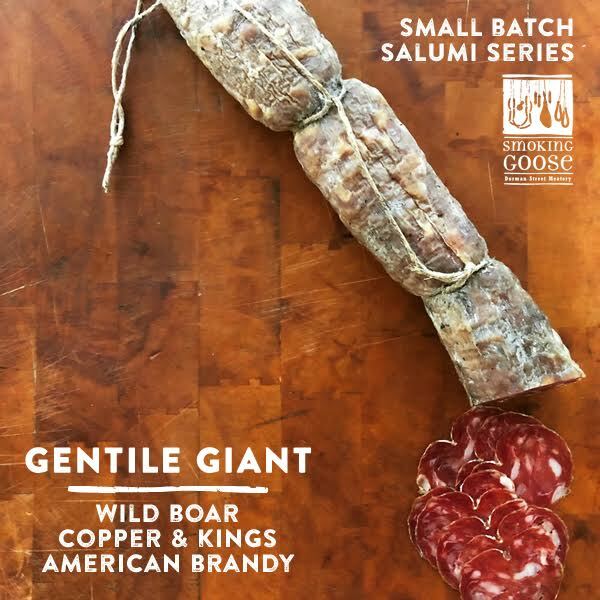 Wild boar, trapani sea salt, Copper & Kings' American brandy. 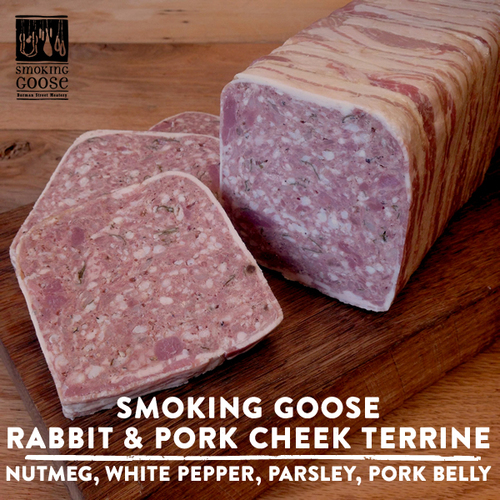 Tied in the most prized portion of the natural casing, what Italians call gentile (pronounced jen-tea-lay): reserved for royalty of 14-16th Centuries, this incredibly delicate casing is rare and takes more training to use but provides the ideal environment for full and flavorful fermentation while maintaining a tender texture .